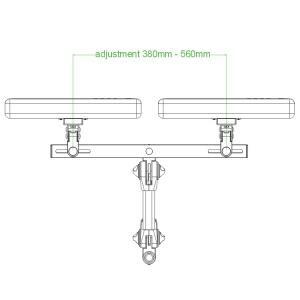 Grommet mount adjustable dual LCD monitor arm(model #60220-2E series) - Sallas Industrial Co., Ltd. This grommet mount adjustable dual LCD monitor arm is designed for mounting 2 LCD on one adjustable arm, and is small in size, light weight, of high quality appearance and competitively priced. The design incorporates effortless height, tilt and rotation adjustment of the monitor. Ruggedly constructed from light weight aluminum alloy arm parts with quality surface coating and provision for internal housing of monitor cabling. Patented counter force lift design incorporating knob-less, quiet and smooth dampened operation. Enhances user comfort and convenience through effortless adjustment of the screen position for optimum viewing angle. most comfortable viewing height. Minimizing user fatigue. 360 degree arm side to side rotation and 180 degree display side to side rotation. 90 degree portrait/landscape pivot rotation. 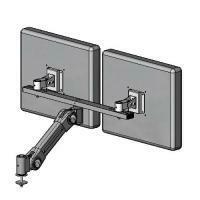 The mounting position of LCD pivot head on extended bar can be adjusted to fit different sizes of LCD panels.